With DC’s recent announcement that they are wrapping up and closing down the Wildstorm imprint of books it is fitting that we have been looking at one of that imprint’s finest works. Begun in 1998 at the time when Warren Ellis was helping to redefine the Wildstorm universe, having wrapped up his run on “Stormwatch” and launching “The Authority” to widespread acclaim. “Planetary” represented something different again. Instead of the usual superhero collective, bound together to fight for truth, justice and the status quo, the Planetary team are charged with excavating the secret history of their world and responding to reports of the weird and wonderful like a turn-of-the-century Fortean endeavour. This device allows Warren Ellis to explore any number of genres at will, and to comment upon fiction and our relationships with it. We are quickly introduced to our guides through the weird and wonderful universe the author has created. First up is curmudgeonly Elijah Snow, a century old man with the gift of manipulating the cold and with massive gaps in his memory; Jakita Wagner, a woman with a low threshold for boredom, super-strength, speed and durability; and The Drummer, who can detect and read just about any form of energy. As we follow them through the first six issues we are shown a collective of early 20th century adventurers, amongst them versions of The Shadow, Fu Manchu, Tarzan and Doc Savage, an island in the no-man’s-land between Japan and Russia populated by monsters, a Hong Kong cop/ghost story and more. Each of these stories throws the reader into a particular genre from comics, literature or cinema, and demonstrates Ellis’ understanding and affection for each of them while placing them firmly into the Wildstorm universe. All of these stories are fun and well executed but it is only with issue four that Ellis begins to present us with the real plot of the series, namely uncovering the secret history of Elijah Snow and of the secret chiefs of the world, a shadowy conspiracy known as the Four. This provides the main impetus for the remainder of the series but in this first volume we are only given the most meagre of hints as to what this might entail. John Cassaday is a well-known figure in the comics industry and that is primarily due to his work on “Planetary” (sure, his “Astonishing X-Men” run didn’t hurt either, but that came later). The genre-straddling nature of the series gives Cassaday the opportunity to illustrate anything from a pitched gun battle to a superhero punch-up and he takes on the challenge with aplomb, proving his range and marking him out as a fan favourite artist. What amazes most is how fully formed he is as an artist even at this early juncture, and that, in my opinion, he wouldn’t do his best work until volume 3 of this series. 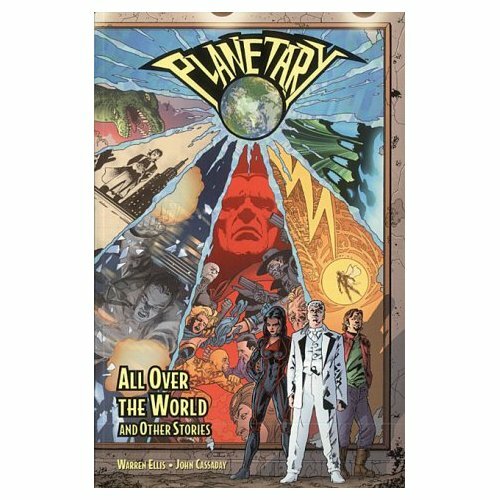 “Planetary” hasn’t made as big a splash as many other works by the author from the same time period, and this is for a number of reasons. Firstly, the simple fact that this is not an easy comic to classify, not falling into any of the basic classifications existing in the industry. Another factor is the massive delay on the final issue, arriving as it did several years after its predecessor. As a result of this many people will not be familiar with the work as a whole, but I suspect in the years to come as more people are able to either finish the series or encounter the entire run for the first time, “Planetary” will be remembered fondly as one of Warren Ellis’ finest works, brought to life by the stunning work of John Cassaday at the very top of his game. And if you don’t believe me, you presumptuous little apes, then believe Mr Alan Moore, whose introduction graces this very volume. Enjoy.